Lyrica is featured in today’s game. It is one of the 14th IMGA nominees and in this short article, you’ll learn more about the game. Could you describe your game? Lyrica is a rhythm game combined Chinese classical poetries and modern music. The story depicts a young man Chun who wants to become a musician. One night he has a dream that he travels back to the ancient past in China and encounters a mysteries poet. The story combines well-known historical tales and classic poetries that will gradually unfold as gamers proceed playing. 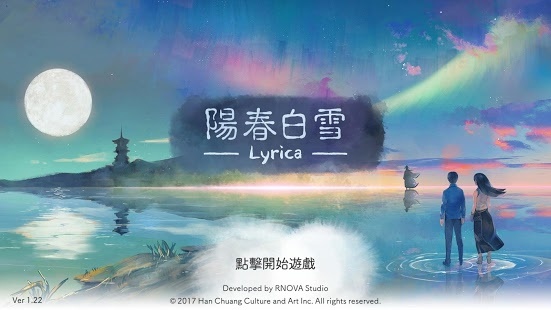 Lyrica is the first game that combined Chinese classic poetries with a rhythm game. It’s also the first game that applied Chinese calligraphy in a rhythm game. Furthermore, it’s the first rhythm game that collects a cappella and indigenous music. We created new gameplay and storylines for an entertaining game that works well with classic literature. It’s a game that’s both fun and culturally nourishing. Lyrica exhibits the elegance and richness of Chinese culture that will attract people who adore culturally extensive games. All in all, Lyrica is a creative, groundbreaking and culturally enriched game, that’s why we think we will win the Grand Prix this year. Special thank to the developer for answering the questions, and thank you for reading! Hope you enjoyed! !